During the busy spring months, when blooming flowers are everywhere on nursery tables, it’s easy to overlook plants that don’t show off their color until late summer. I have many plants in my garden that are just coming into peak flower in August and September. Whenever we open our garden to guests that late in the season, people see these late bloomers and ask me questions. They aren’t sure whether they’ve seen them before. 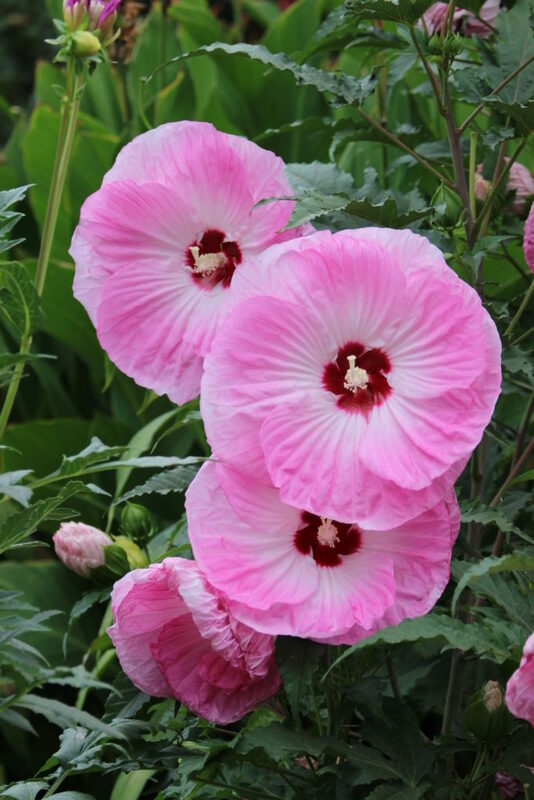 Among these plants is Hibiscus moscheutos, otherwise known as perennial hibiscus or, more commonly, hardy hibiscus. I would encourage more garden centers to stock them. 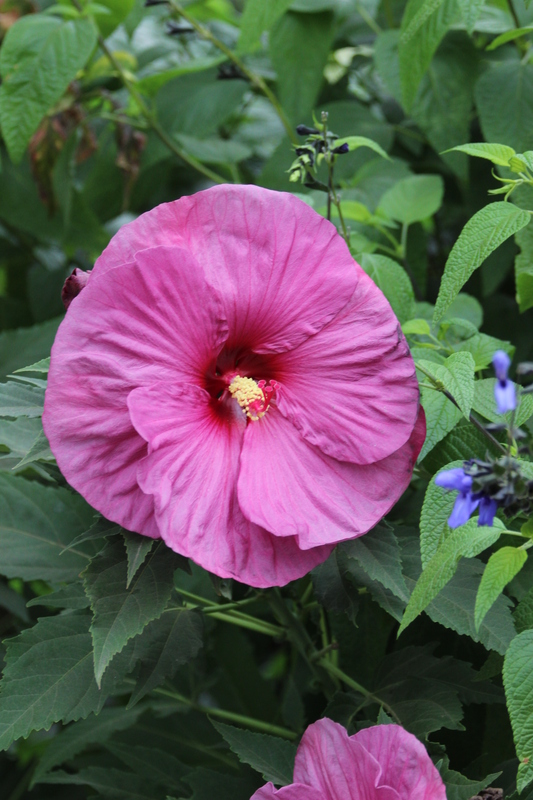 This hibiscus should not be mistaken for some of the tropical or semitropical types that are typically seen in Hawaii and Southern California. Hibiscus moscheutos or hardy hibiscus is native to the eastern United States. It is grown in gardens throughout the Midwest, where the winter temperatures are much more severe than what we experience in the Pacific Northwest. For gardeners in this part of the country, it is a winter-hardy perennial. I’ve known about hardy hibiscus for quite a while, but I didn’t grow it in my own garden until just a few years ago. Now, it seems as though I just want to get more! When touring different summer gardens throughout our area, I had rarely seen one until I visited Doug Barragar’s garden in the Raleigh Hills area, southwest of Portland. Doug gardens on a corner lot and, while driving to his house, I was unfamiliar with the area where he lived. While I was rounding a corner, I knew immediately which garden was his. It was a show of color we do not often come across in September. There were roses, hydrangeas, hardy fuchsias, dahlias, lilies and many hardy hibiscuses all in full bloom. If ever there was a traffic stopper, this flowerbed was surely it. The hardy hibiscus blooms were of particular interest to me, as I so rarely see them in a garden or in garden centers. At the time of my visit to Doug’s garden, I had visited several garden centers within the previous two weeks without seeing any displays of this plant. Why, I wondered, was it not featured? Doug told me that he has 50 hardy hibiscus plants and that 24 different varieties are represented in his collection. The plants have had no insect or disease problems. The only downside that Doug mentioned is that some of the taller varieties need to be staked. Some of the tall varieties can reach 5–8 feet in height, but newer varieties are being developed that are smaller and more compact. These new smaller varieties reach the 3–4 foot range. Doug buys varieties with different blooming times so that he has some plants flowering in mid-July and others that will continue through October. Most plants will have flowers 8–12 inches across. 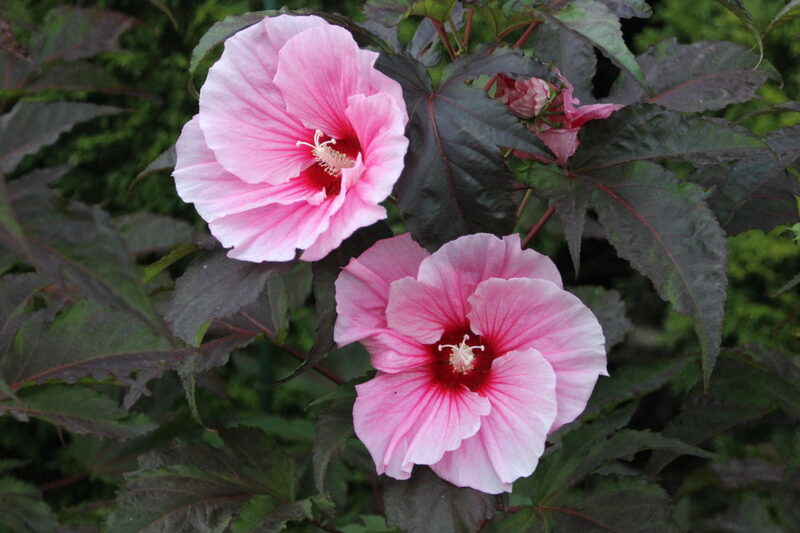 Hardy hibiscus plants do best in a full sun location and will require summer watering. They are not drought tolerant plants. After a frost, the foliage will begin to die. At this time, Doug cuts the stems back to about 12 inches above the ground. Since these plants tend to be late in sending up new growth, leaving the stems is a good reminder of where they are so they are not dug up with new spring plantings. Once new growth has emerged, the stems tend to grow quite quickly. Some of the new varieties can also offer an added bonus of maple-like leaves that are very dark, almost maroon in color. This makes a spectacular background for the large flowers. ‘Summer Storm’ is just such a plant. Full sun is required to turn the leaves dark. With less sun, they will stay green.